Flying over roofs, running on walls. I have a question for the Chinese men of my generation who used to so love those black and white Cantonese wuxia movies of the 1950’s. When you listen to this Chinese pipa classical called 十面埋伏, what picture or scene comes to your mind? I believe, like me, many of you will immediately visualize a night scene where a masked intruder in black, crouches and walks stealthily on the roof of a building. That’s the same kind of scene that Crouching Tiger Hidden Dragon director, Lee Ang (sigh … those Americans changed his name to Ang Lee) so skillfully weaved into the beginning of his movie. However, I am glad that he used the drums as the background for that famous Zhang Ziyi - Michelle Yeoh fight scene - one of the best ever, in my opinion. It adds so much to the excitement. 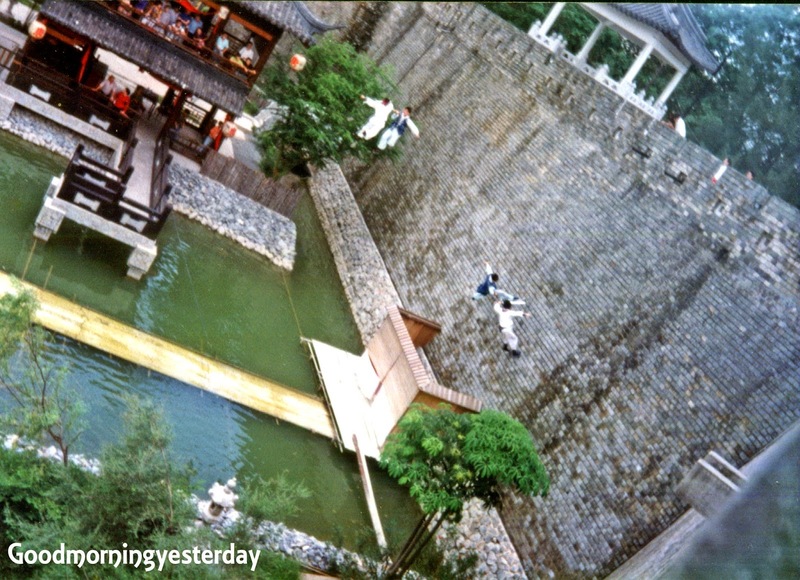 In Cantonese, we call this type of action, fei sim zhao pek (飛簷走壁)** or "flying over roofs, running on walls". Through the magic of modern-day special effects, Lee Ang helps us to see what it means to literally “fly over roofs and run on walls”. With the help of YouTube, we can enjoy that scene again. Still it would be fun for us oldies to view those old Cantonese fight scenes once again just for the nostalgia. Anyone know where we can view them? Can you guess where this photo was taken? Answer here. ** It’s quite confusing. There are actually two versions of this metaphor. The more popular version is 飞檐走壁 ( fei yan zhao pek – thanks to KL for enlightening me) which I found in many websites. But I managed to find one (here) which gives a Cantonese pronunciation that is similar to that which my mother taught us. Last week, Geoff Pain sent me 3 mid-1960’s photos of the Wisma Indonesia at Orchard Road. Anyone remember this place? 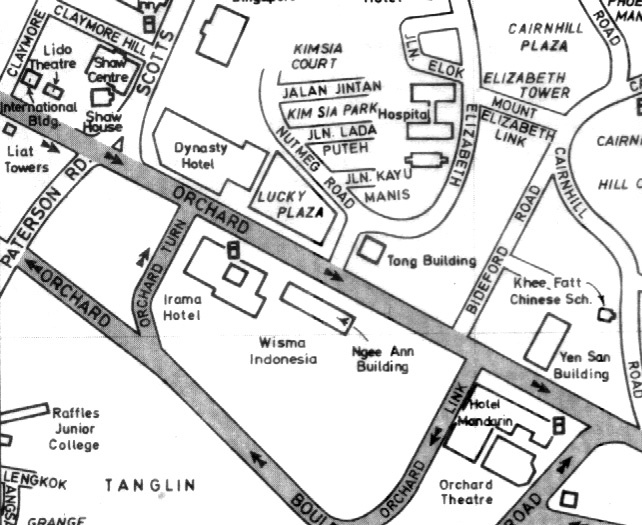 It was relocated to Chatsworth Road and in it’s place the Wisma Atria was constructed. Below is a scan from my 1981 street directory. You will notice that many of the landmarks there have been either demolished or rebuilt; e.g. the Lido Theatre. Do you see a hotel called Irama Hotel next to Wisma Indonesia? Anyone remember this place? 1) What was the name of the Chinese restaurant at the International Building next to Lido? 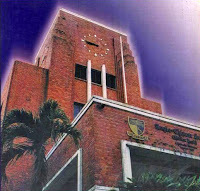 2) What was name of the institution that previously occupied the premises marked Raffles Junior College? Thanks to Geoffrey Pain who sent me this 1960's photo recently. Can you identify the building? Hint: It was demolished years ago; and replaced by a new one not far away. For those who are getting tired of old buildings; maybe you'd like to try this New Building Quiz. And here's a reminder to tune in to Okto tonight for another episode of Foodage. I have always been fascinated by clock towers. Whenever I see a clock tower, I am tempted to take a photo. 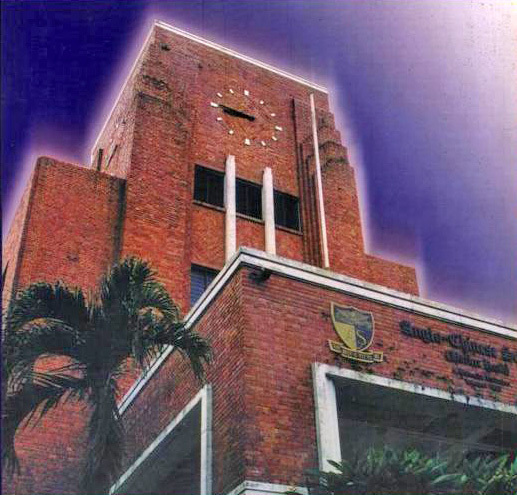 Maybe it’s because for many years I studied at a school which was famous for its beautiful clock tower; which sadly had been demolished and replaced by a modern replica; like so many old beauties in Singapore. This quiz should be easy compare to my last one. Can you identify these 5 clock towers? The first one is not counted because the name of the school is given. Whenever you watch any show about food, they will tell about all the places where you can enjoy wonderful food. But Foodage is different. As you might expect, the bulk of the first few episodes contain snippets of old-timers reminiscing about the nice food experiences of times past. But tonight you will (probably) hear something quite different. A few of us will let you have a taste of the atrocious food that we NS boys had to endure during our army days in the 1970’s. The two photos below were taken during my first route march as a recruit in Safti in 1971. The place is somewhere behind the Nanyang University; and probably within the grounds of the present NTU campus. We were having a break and waiting for the rations truck to arrive with our lunch. These rations come in ugly metallic containers and we had to queue up with our mess tins into which the cookhouse personnel would scoop everything; rice, dishes and soup. I remember our route march took us past the cemeteries near the end of Choa Chu Kang Road and not far from Safti Live Firing Area A (Sungei Poyan). This part of Singapore has not changed much and remains beautifully green and serene. ANSWERS (17 Aug 2011) – Answers in red below the photos. It’s not easy to find old bus shelters in Singapore nowadays. I am referring to those with orange and white stripes on the roof and orange plastic seats. Except for some really ‘ulu’ places like Lim Chu Kang Road and Old Choa Chu Kang Road, most bus shelters are of the modern kind like this one at Bukit Timah Sixth Avenue. Of course they can also be found as temporary bus shelters in areas where MRT construction is ongoing, such as Rochore Road and Bukit Timah Road. Hence I was quite surprised to see them in some urban areas. In the process of travelling around Singapore, I have seen them is at least 7 or 8 such places. I tried to take some photos. But it is too troublesome and so I simply lifted the rest from Google Street View website. Can you identify the locations where these 5 old bus shelters are found? I think No.1 has been upgraded recently. Answer: Corporation Road. The buildings behind are part of the Jurong Junior College. Answer: West Coast Road near Teban Gardens. Behind the bus stop is the Pandan Reservoir. Answer: Ubi Avenue 3 near to the Traffic Police Dept. 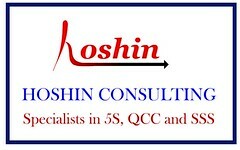 Answer: Choa Chu Kang Avenue 1 near Keat Hong Shopping Centre. 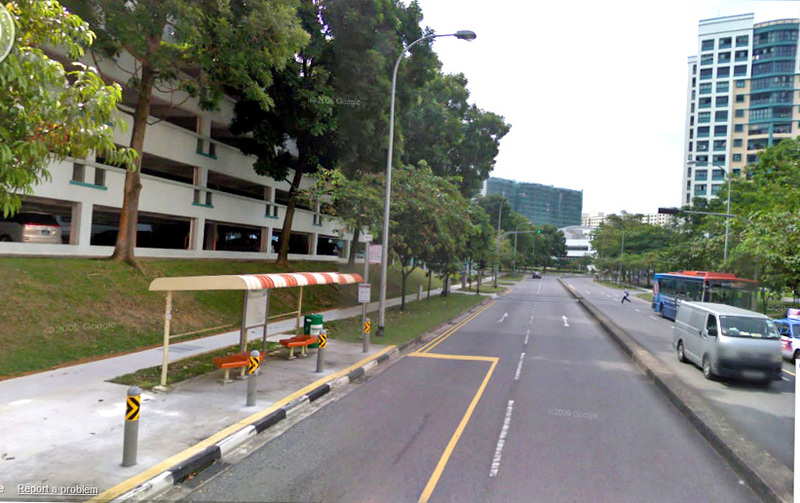 Answer: Jurong West Central 1. 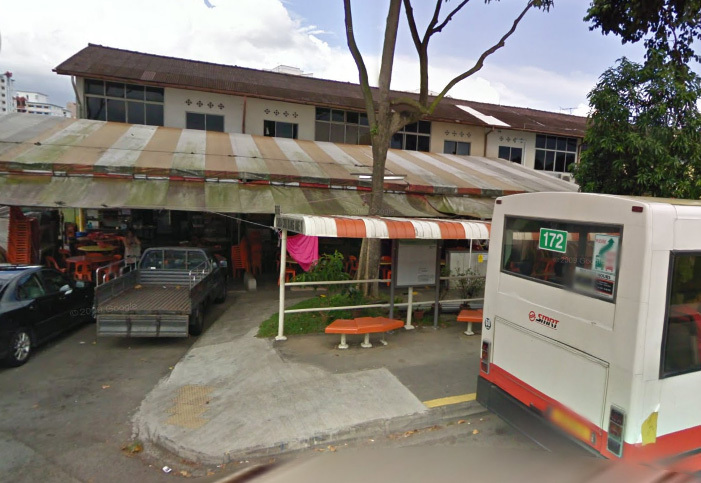 Another quite unexpected place to see such an old bus stop is at Zion Road opposite the entrance to Great World City. 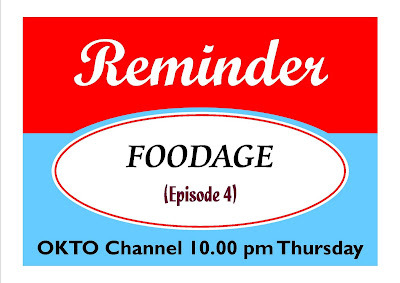 Tonight you will get to see myself, Peter, Unk Dicko, James Seah and many others reminiscing about the food we enjoyed – and loathed, in the case of the army food – in years gone by. Last week, a few of us gathered at my place to watch the debut and enjoyed a round of durians, mangosteens, langsat, longans, keropok and ang ku kueh. Needless to say, our Lor Arh seller got a standing ovation for his fine acting. 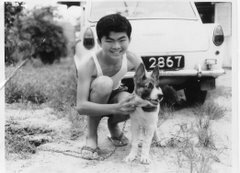 Tonight you will probably hear him narrate a touching story that happened at the old National Library @ Stamford Road. Do tune in. Link to Foodage Facebook Page. 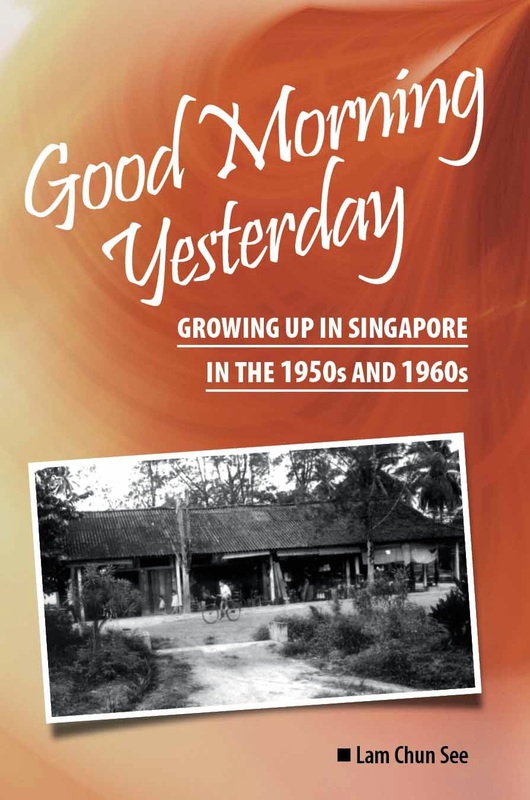 The photos below well illustrate the speed at which the physical landscape in Singapore changes. Can you still recognize this place which I blogged about in 2008 (here)?. Fast forward three years and all those buildings bequeathed to us by our British colonial masters have disappeared completely. As one who lives nearby; and will be a direct beneficiary of the development taking place here at the typical Singaporean breakneck pace, I should not complain. Nevertheless I cannot help feeling a sense of loss because yet another part of our heritage has vanished. Eh .. if you want to see the main star in action, you will have to wait till Episode 2 next week.